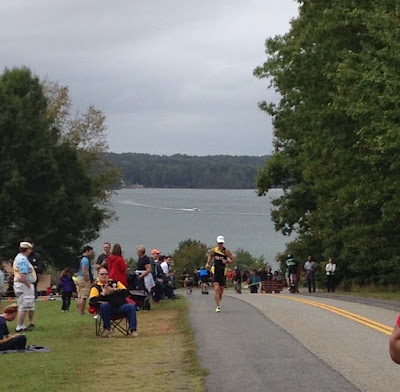 I finished my final race of the season yesterday - the Giant Acorn Sprint. 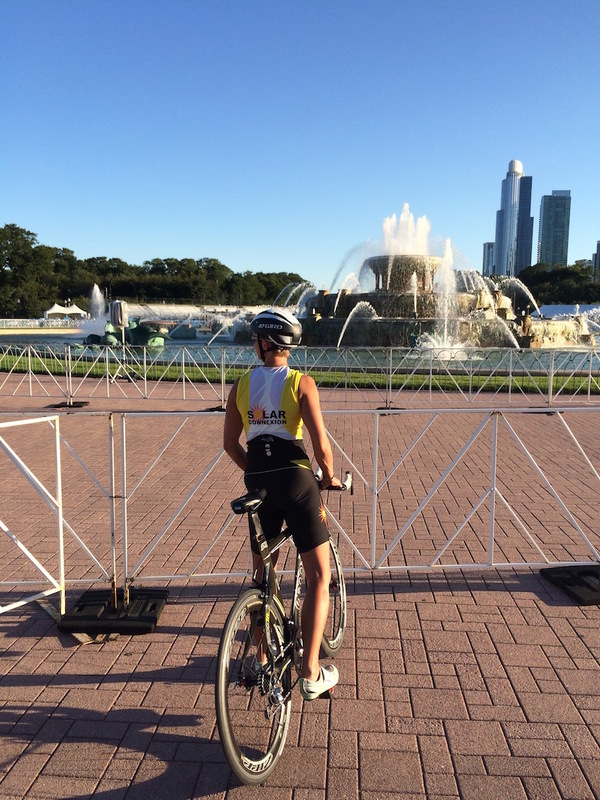 I was coming off of Chicago, a week with a cold, and a total of an hour and a half of "training" in the week prior. Oh well! I was very relaxed, had zero pressure, and was ready to just have a good time! The water was in the low 70's which was a nice change from the low 60's of my last few races. I actually got hot in my wetsuit. 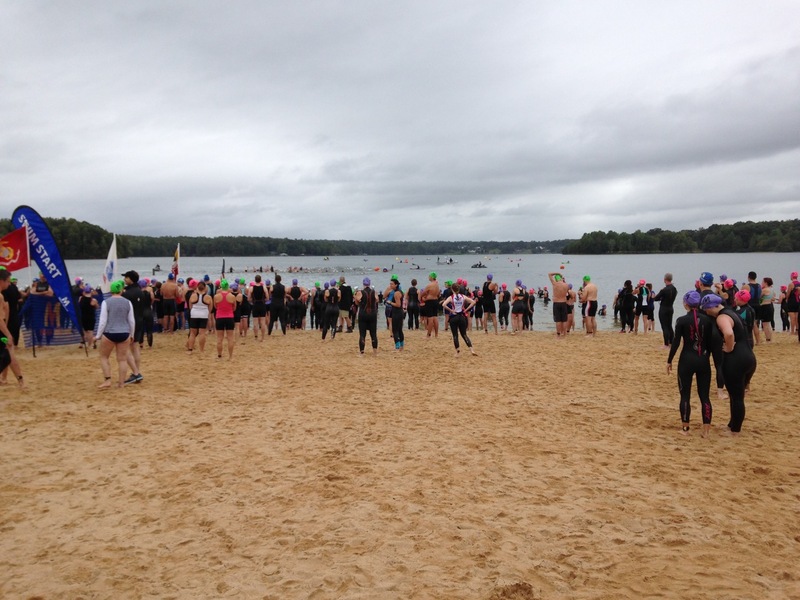 I had a good-for-me swim and noticed there were not too many from my wave (the over 40's) ahead of me. It turned out there were seven ahead of me, fewer than usual. I could tell in the swim that my head was in a good happy place. In transition I had trouble buckling my helmet strap. I'm realizing now, looking at its position on my head, that it was probably twisted and half the clasp was upside down. Duh! No matter! 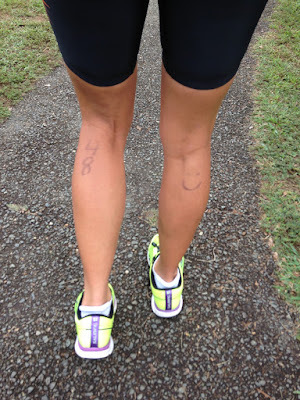 I also had trouble getting my feet into my bike shoes once I smashed them down to pedal up to speed. That's been an ongoing problem the last few races and I need to figure that out. Then it was time to head out on my run, which starts up a hill, and continues up-up-up for the first 3/4 of a mile. I felt pretty decent and knew at some point we'd enjoy the down-down-down. The course rolled up and down before it finished on a running path through the woods that spits you out onto the sidewalk along the lake and into the finish chute! Very fun!! 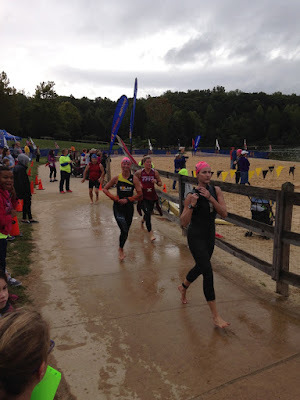 I finished 20s behind second place but I was a swim wave behind her so there was no opportunity to try to chase her down. 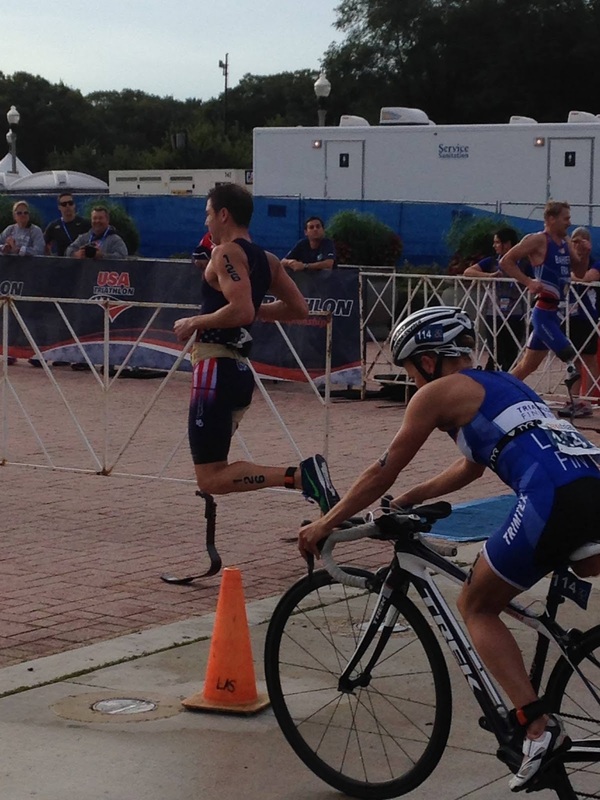 Nothing inspires a little extra effort like seeing competition up ahead! I had a really good time. It was the perfect happy ending to leave me looking forward to next year. Better to finish wanting a little more (which I do, believe me) than to be burned out. Next year it'll be top 'o the age group for me. 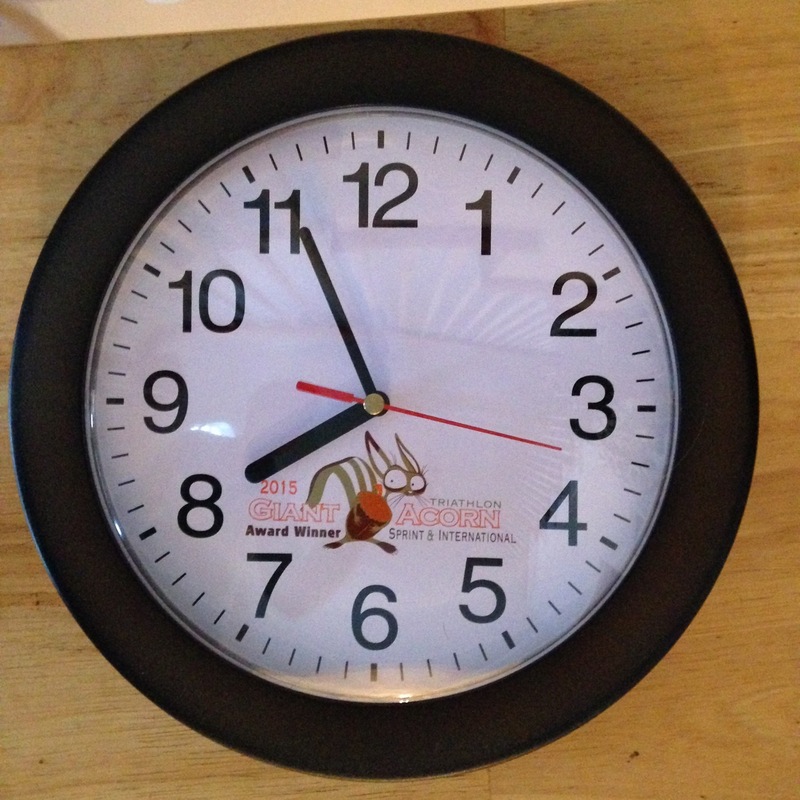 We got cool clocks for our efforts! 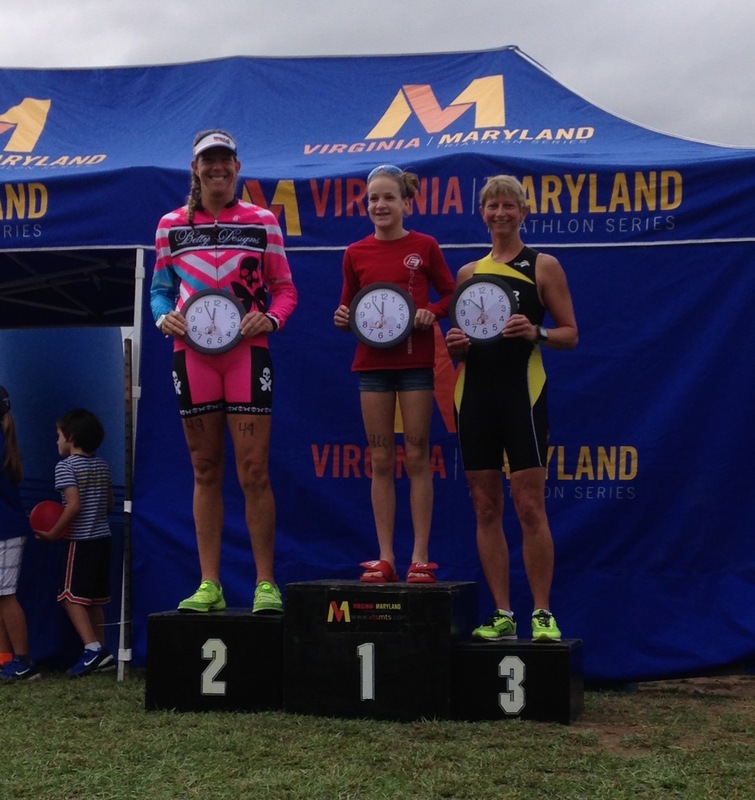 Thanks to the Virginia Maryland Triathlon Series for another top-quality event and enjoyable regional racing! All the best to my family, friends, and coach as they deal with me transitioning to "off season*." * - possible side effects of "off season" may include century rides, pub runs, trail runs, and other activities that are not technically training or racing. 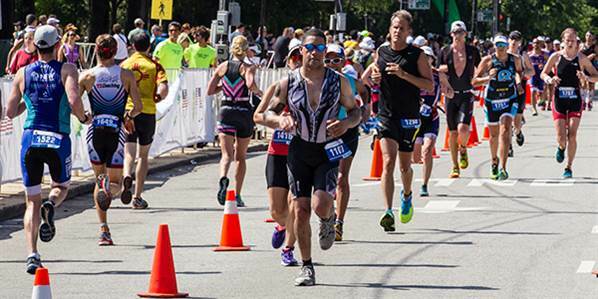 "Off season" should be avoided if races remain on your calendar. "Off season" should not be used for extended periods of time. If symptoms of training and racing remain (obsession over pace/volume/distance/structure), consult your Coach and Sports Psychologist. 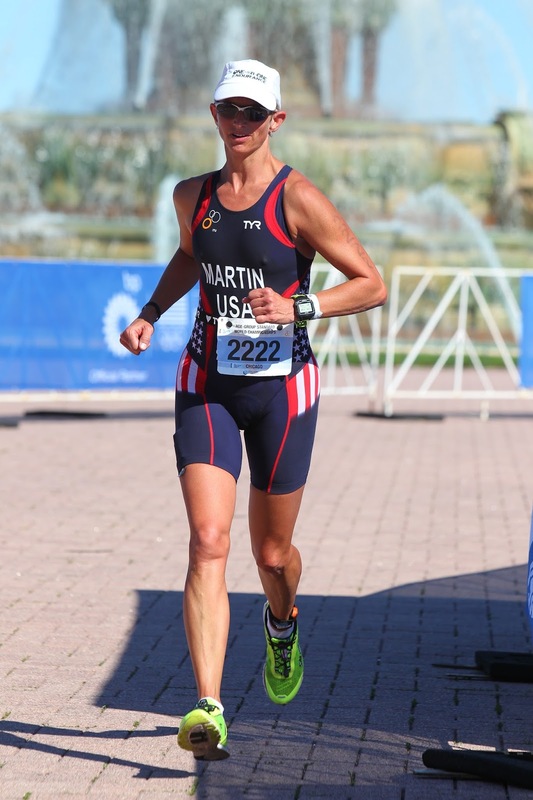 For best results with "off season" get adequate rest, eat a healthy diet, adjust caloric intake appropriately, and get hooked on a Netflix series. All of the athletes at the ITU World Championships...at ANY race...owe their race day to the volunteers. Without them the race could not happen. 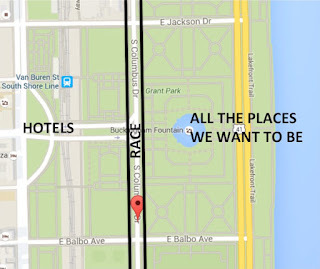 We'd be hungry, thirsty, rule-breaking, disorganized, and dangerous! 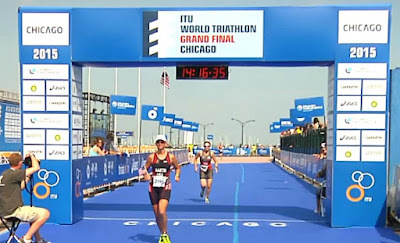 This post was inspired by one particular group of volunteers at the ITU World Championship that really stood out to me, and those were the crossing guards. They were responsible for making sure that pedestrians safely crossed the multiple lanes of cyclist and runner traffic without interfering in any way with the race of a runner or cyclist. 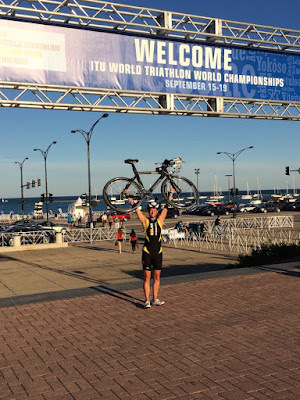 The main drag of the race was S. Columbus Drive, which paralleled the lake, and which stood between ALL of the hotels and ALL of the places we wanted to go: transition, expo, swim start, and the finish line. 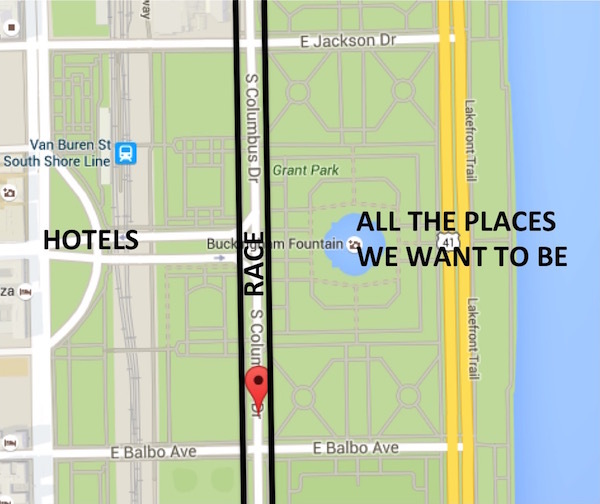 We walked back and forth across that busy race course many, many times. South Columbus is very wide. V-E-R-Y wide. 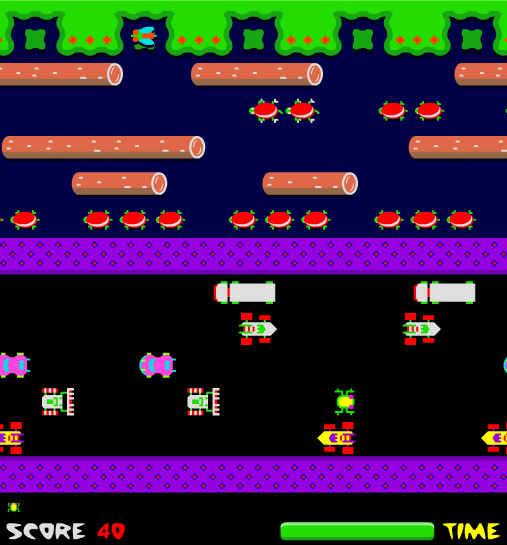 It was basically Frogger with bikes and runners. The entire course was lined with barricades with just a few areas for crossing. 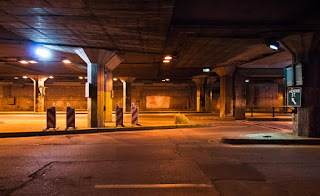 At these designated points, we'd queue up and wait to be released to cross the road in multiple stages, with tiny "holding pens" and crossing guards stationed part-way across. 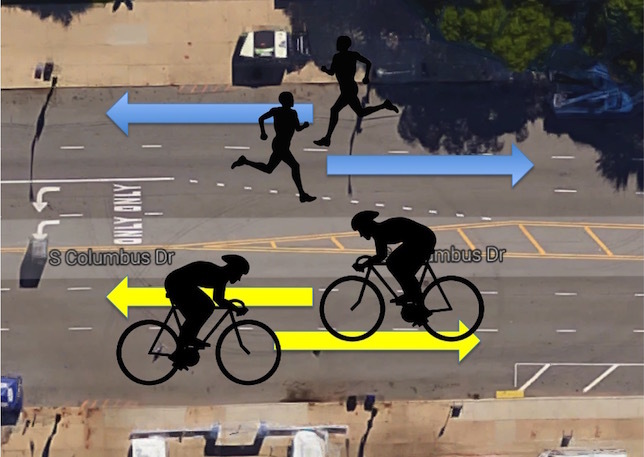 If you waited until it was clear both ways of bikes and runners, well you'd be waiting a LONG time. Till maybe Sunday. It could get a little tense as they'd release a few of us at a time, or make way for athletes late to transition with bikes, and they'd yell reminders for us to HURRY across. It got a little scary sometimes, but I never saw an incident or a racer in jeopardy. They basically played verbal Frogger, with dozens of frogs that were not all good listeners. 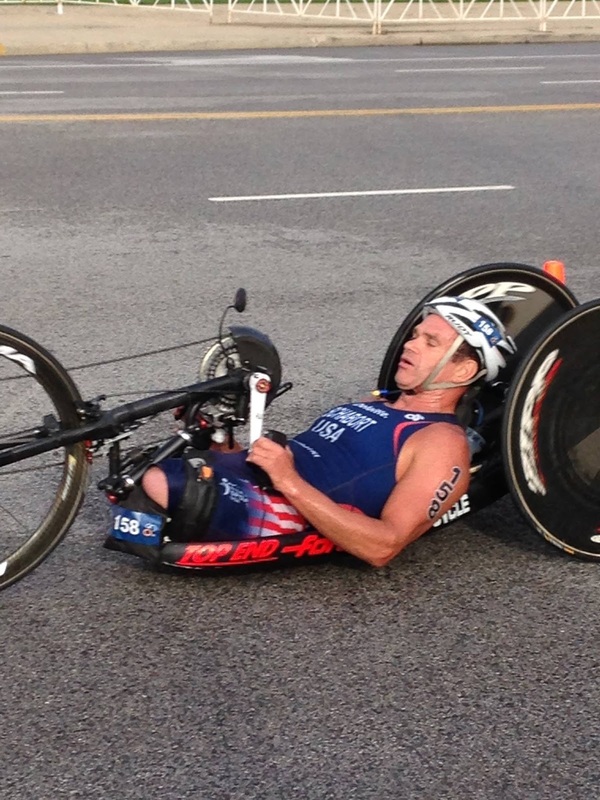 A moment of inattentiveness could have cost an athlete their race, or worse. It could have been a disaster. Temporary elevated walkways would have been nice, but in the absence of that option, the volunteer crossing guards did a great job. I wish I would have said thank you to all of them, and I hope I said thank you to at least a few. 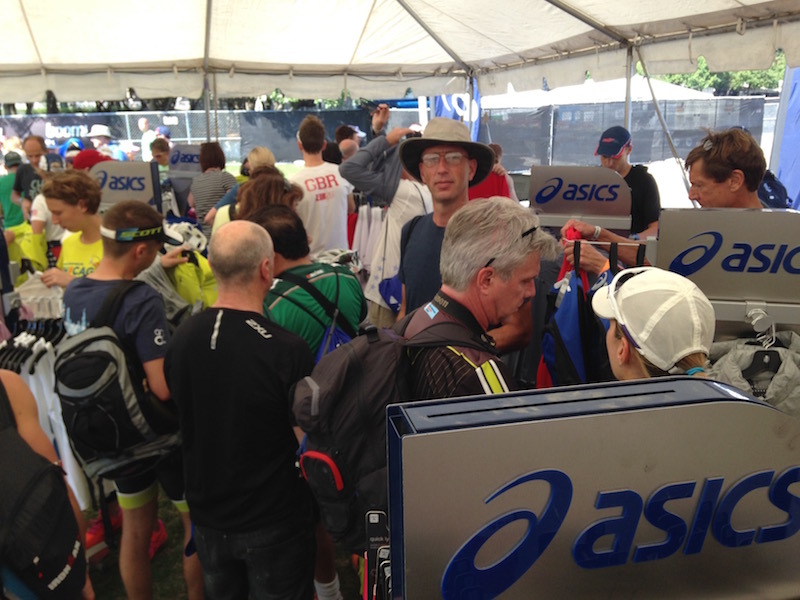 They had a tense job holding back triathletes who are not among the most patient people in the universe! Thank you volunteer crossing guards, volunteer aid station workers, chip removers, transition checkers, helpers-up-the swim ladder, and lifeguards. Thank you registration workers, goody bag distributors, and body markers. 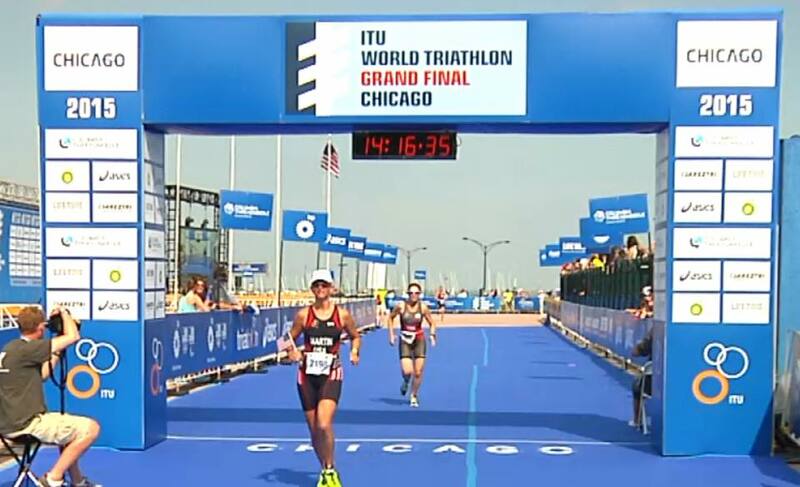 Thank you ITU officials (most were volunteers), moto drivers, and those in countless volunteer roles that I probably don't even know exist but that I depend on. Triathlons #49 and #50 are in the books. 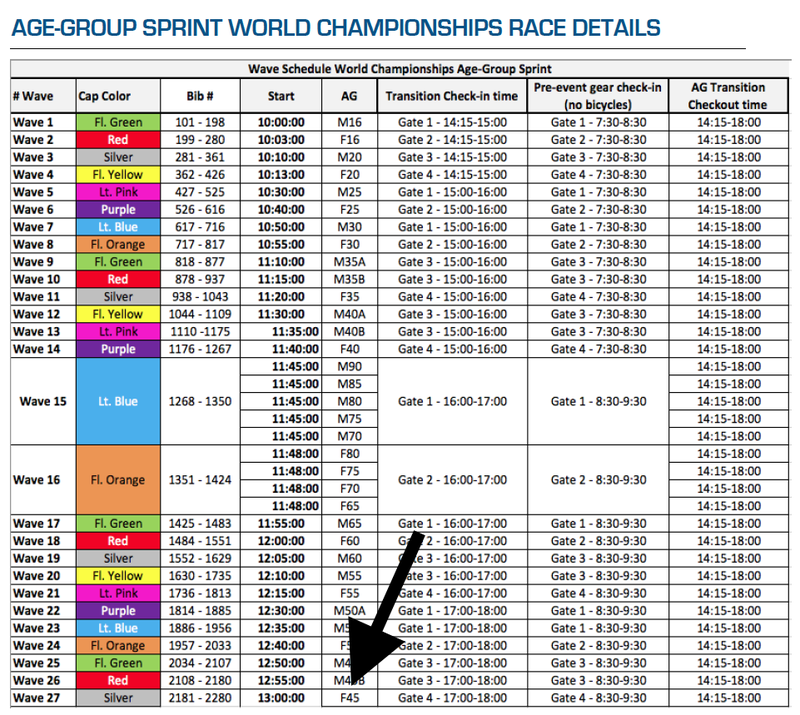 Among the F45-49's, I finished 15th in the Sprint (out of 88), and 30th in the Olympic (out of 78). Thursday's sprint was a decent race for me -- Saturday's Olympic/Standard, not so much. (I had a sore throat starting Friday that turned into a cold over the weekend so who knows if that played into it or not...excuses, excuses.) It matters not. 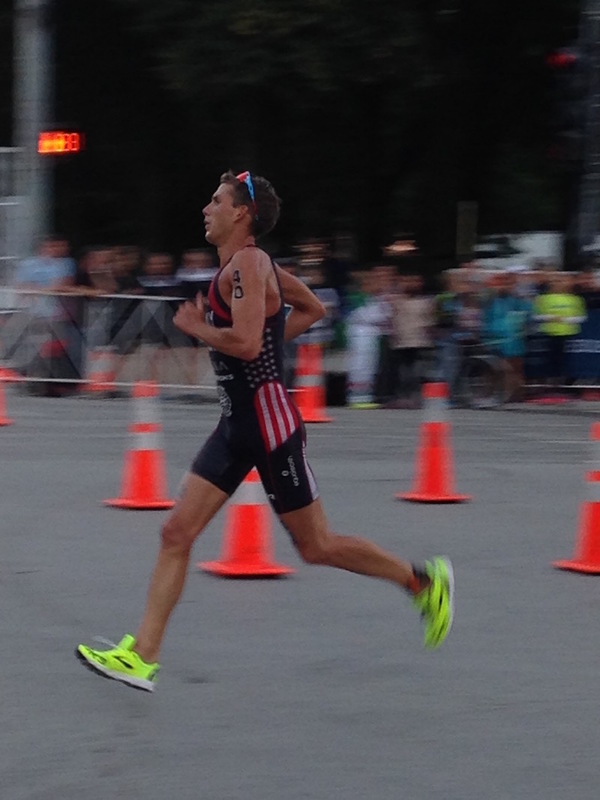 I gave what I had on the day and loved being a part of the ITU World Championship week! Who needs another race report about being pummeled in the swim, keeping up watts on the bike, or the final kick into the finish line? Not me. 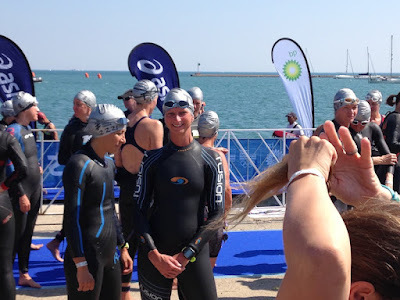 And considering my races occupied a fraction of the 4-1/2 days I was in Chicago, I thought it might be more fun to share some of the (random) highlights that come to mind when I recount the whole experience. I can't find me, but I'm in there. The Parade of Nations heading into the opening ceremonies is pretty awesome too. I have a photo album from that on Facebook. Starting Last. Being in the last of 27 (sprint) or 31 (standard) waves, and starting 2-1/2 to 3 hours after the first wave kind of sucked :-( To me, the earlier the better. 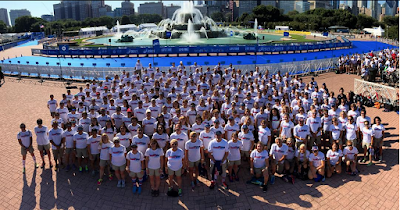 A 1 pm start on Thursday and 12:40 pm start on Saturday (that was then further delayed) was tough for me, as well as for most of my fellow F45-49'ers. It would have been nice if we were not last in both races. 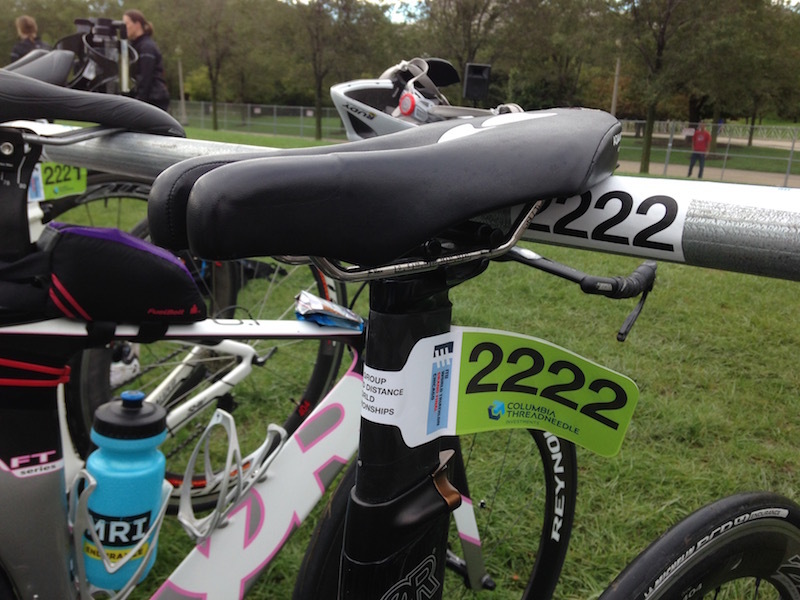 Mix it up, race organizers. Pink Equity. 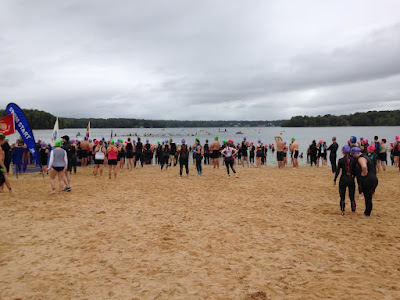 Perhaps you are aware of my feelings toward pink, so it was refreshing to see that the pink swim caps were distributed equally among men and women. My new gender equity issue is now focused on the "unisex" race tshirts that were distributed, which is basically a man's tshirt that women "get" to wear. Why not supply women's tshirts that men "get" to wear? If you don't like that idea, then offer both!! No Towels means NO Towels. As I remembered from London, ITU said no towels in transition, and they were very serious about that. A washcloth hidden in my bike helmet beneath my race belt was confiscated and found post-race with about a hundred other sneaky little terry cloth bits. Number Matching. 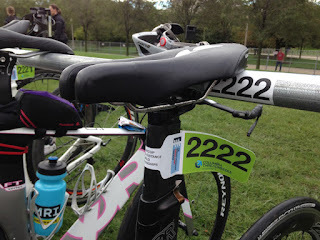 When I got to transition Saturday morning, competitor 2224 was in my 2222 spot. 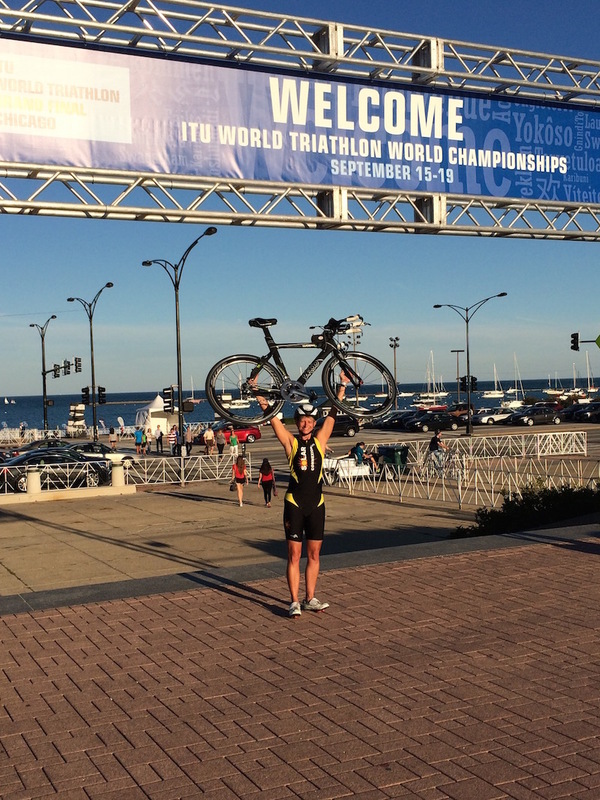 An ITU official was called to relocate the bike and gear. The athlete must have had a case of premature "race brain." 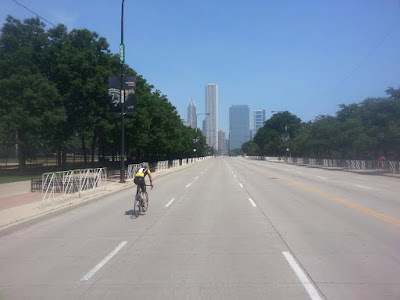 Subterranean Biking: We were not able to pre-ride the bike courses, and based on my observations of Chicago's drivers, I had no interest in cycling on open roads. 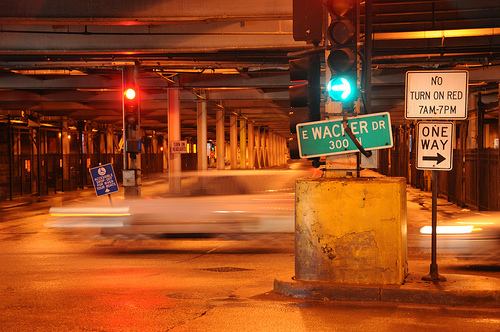 Plus I don't have a horn on my bike, and it seems like to drive in Chicago requires a LOT of honking, often for no reason at all, other than to add to the chorus of urban honking. 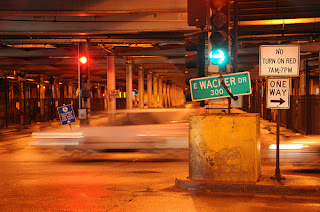 Much of the Standard distance course was the underground portion of a multi-tiered road (Lower Wacker) and on a bus lane adjacent to train tracks. There were lots of turns and you just had to gamble on how fast you could safely take them and then accelerate like heck coming out. The changes from light to dark were tricky, and photo-chromatic lenses left the view a little darker than I'd have liked. But hey, it was fun and different and I felt like a Matchbox car! 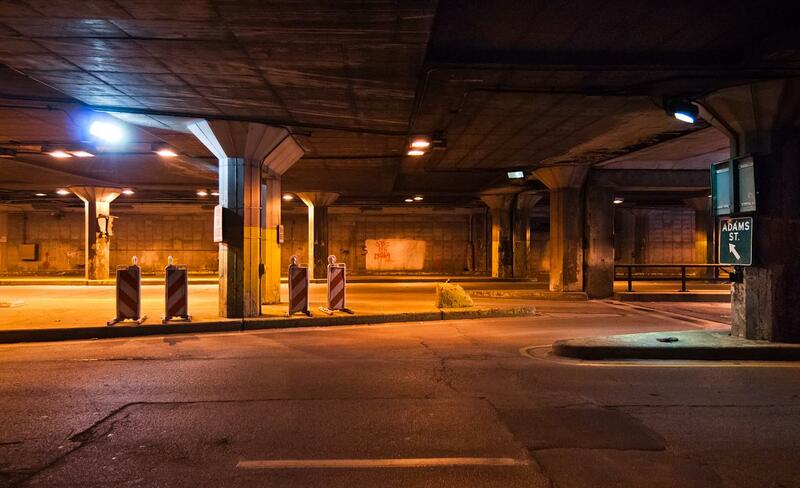 One tip for underground courses: don't plan on relying on GPS or distance numbers. Go by time. Multi-lap run. The 10k runs were 3-3/4 laps (someone doesn't understand fractions because the athlete guide called it 3-1/2). The finish line split off from the course and went for maybe 50m, which meant you had to run right past the finish chute three times, watching the people who were done, and knowing you were not done. Quite a number of people diverted a lap too early, and had to go back out to finish. 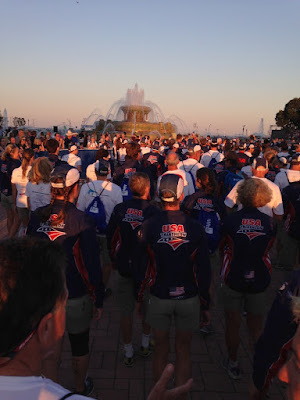 I was able to count up to three - three times past the fountain before finishing. 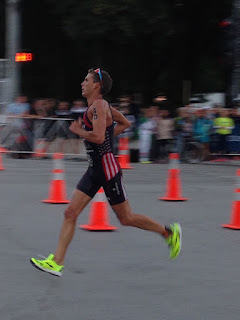 One upside to the multi-lap run meant having spectator friends to look forward to seeing on each lap (thank you Sue and Glenn Jankowitz and Bryan Walsh for the high-fives and encouragement). Team Kits. 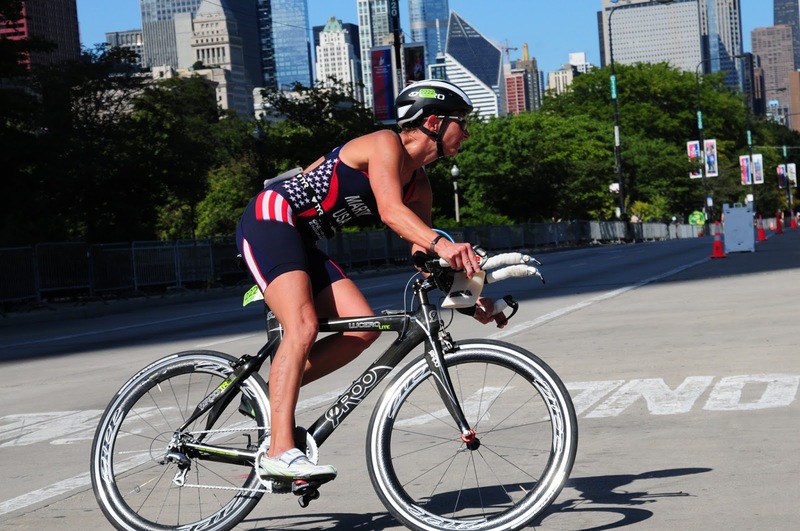 While the Team USA clothing has gotten much better, the Mexican and Italian Tri Teams still looked the best - mainly because they seemed to have an entire wardrobe: cycling jerseys and shorts, tri suits, jackets, tshirts, tights, etc. Runners up in the fashion category would be Great Britain, New Zealand, and Japan. Bike shower. 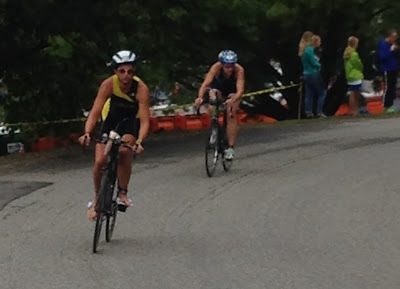 The sprint bike course was SO bumpy and rough on the south end. My drink bottle is open at the top for refilling on-the-fly and the mesh sponge that is intended to be the baffle had been pushed to the bottom. As a result, my sticky drink splashed every where, making a mess of my bike. 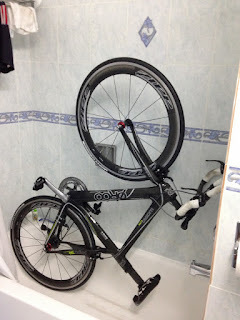 The bike got a thorough cleaning in the shower - first time ever - which worked better than I expected! Meet the Pros. I had an opportunity to meet up in person with some of the fortyninegroup athletes including ITU pro Joe Maloy who raced in the elite event and two-time USAT Collegiate Nationals winner Rudy von Berg who raced in the U23 event. 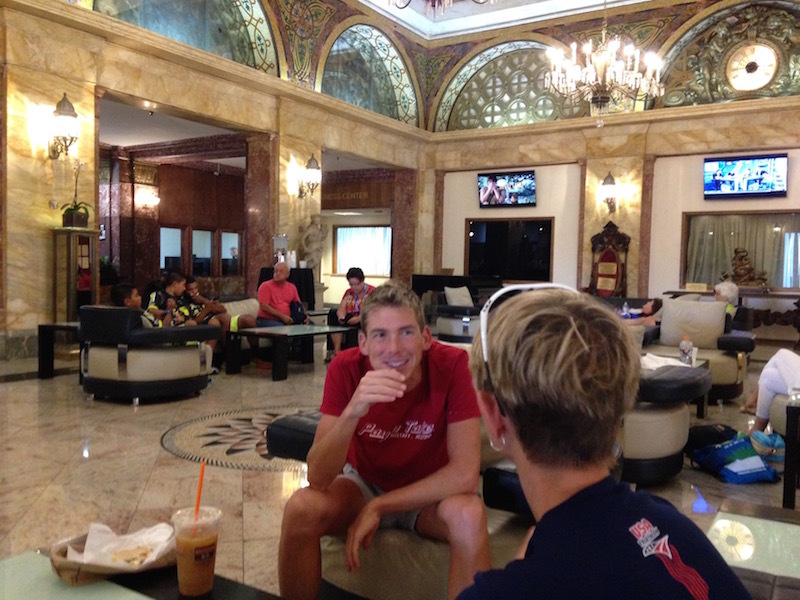 When I met with Joe (photos above) I was wound a bit tight waiting for my race later that day. He really helped me to get some perspective and think about the "calm focus" that he looks to carry into his events. 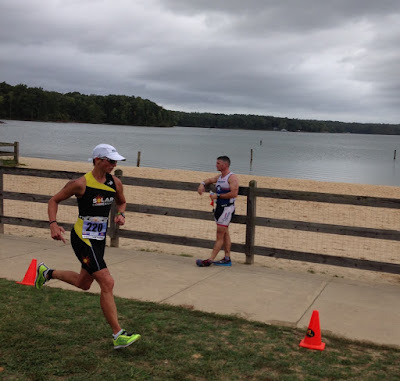 I think that concludes my race highlights! Before I go, I would like to send HUGE thank-you's to Coach Jim of One-on-One Endurance for excellent and attentive coaching for more than six years! Thank you swim Coach Tom for helping me to really enjoy swimming (even if I am still glad when it gets cut short!). 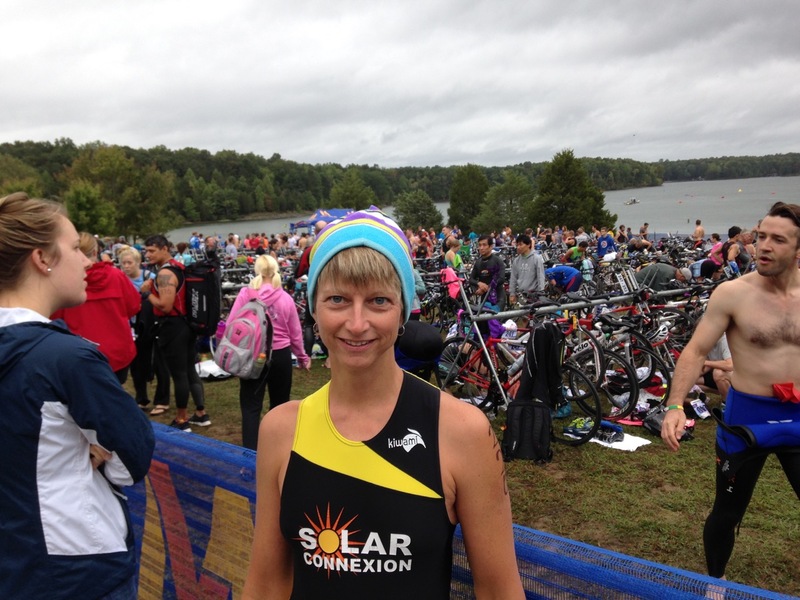 I'm extremely grateful to Equipment Coach, chief Sherpa, and sponsor Bryan Walsh of Solar Connexion for supporting my racing in so many important ways. My family is awesome for letting me bug out for days at a time to enjoy this sport! Thank you Oma for feeding and driving kids and to my parents for cheering and supporting always. I am very fortunate to work with the fortyninegroup and all our pro athletes and coaches who sent their well wishes and congratulations. I could not work with a more incredible group of people! Want more? Check out my ITU World Championship photo album on Facebook. Hello from Chicago! 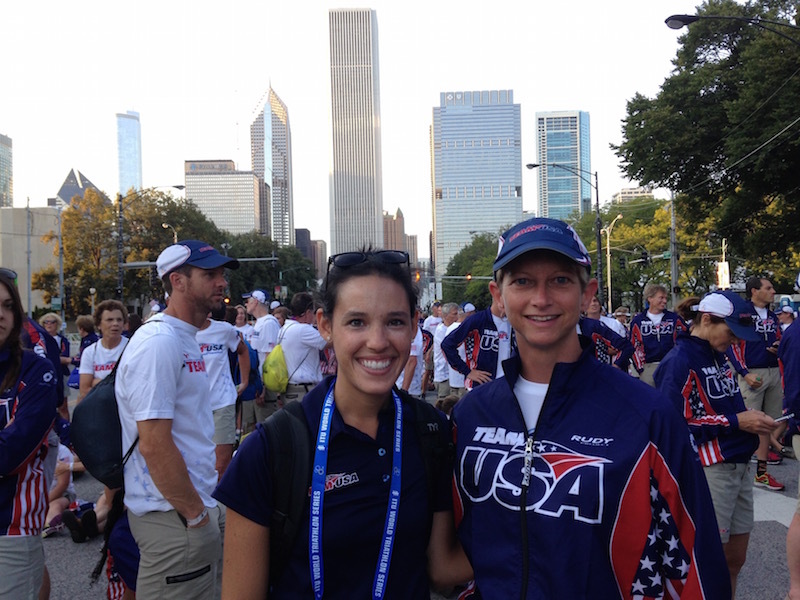 It’s been a whirlwind since landing on Tuesday, for me and for all the athletes here. The venue spans a pretty large area from the expo to the north to transition to the south, and between the hotels and venue there are many many multi lane roads of traffic to be crossed! 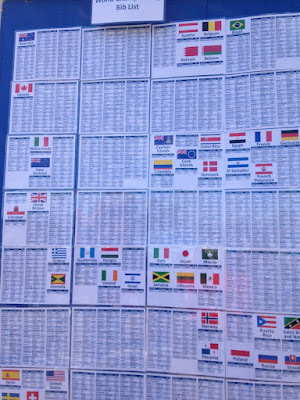 At packet pickup I got my first glimpse of all the countries in attendance and I started seeing all the different kits at the hotel, in restaurants, and along the sidewalks. The day I arrived I was able to get in a short bike ride on the lake front trail just to be sure everything was working mechanically. 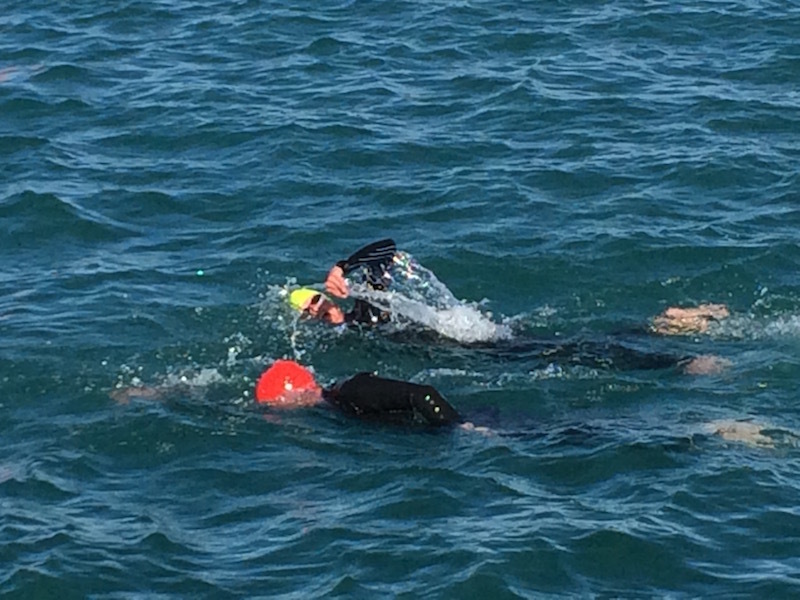 I also got into Tuesday’s swim familiarization. The water was a bit cool and choppy but nothing concerning. It felt good to get in and move around! Wednesday I hit the expo and bought a pullover and a few gift items from an already packed event merchandise tent. My advice is if you want event merchandise, go early as supplies are limited! 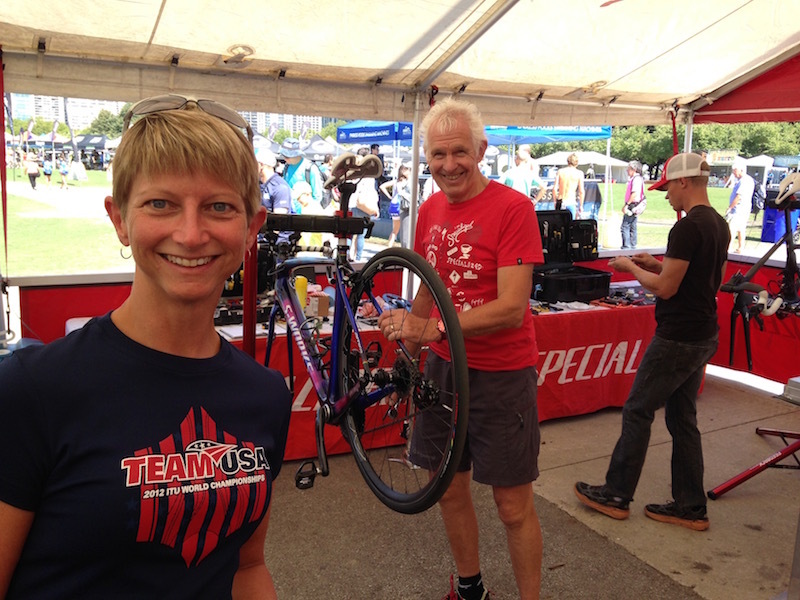 I visited with vendors and even got to see Gwen Jorgensen’s bike getting tuned up! 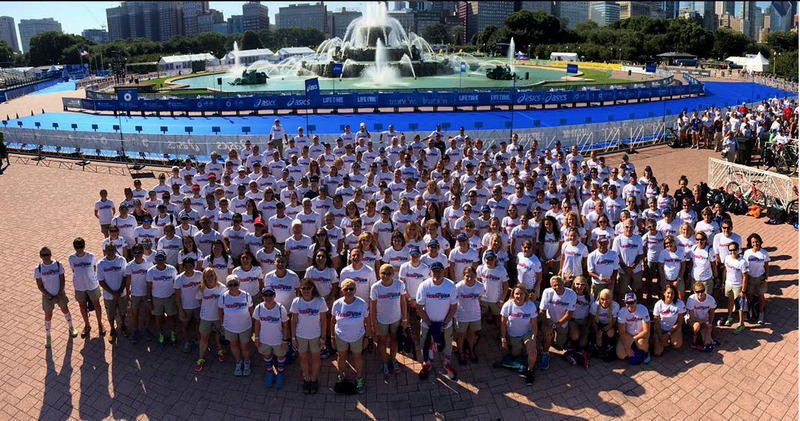 Then it was time for the team photo, bike check-in for the sprint, and the parade and opening ceremonies. I was already starting to feel the effects of so much walking – and believe me there’s lots! Taking the team photo required a lift to fit us all in but it was great fun to be assembled as a team for the first time since arriving. The parade took place on a perfect dry evening with cooling temperatures. 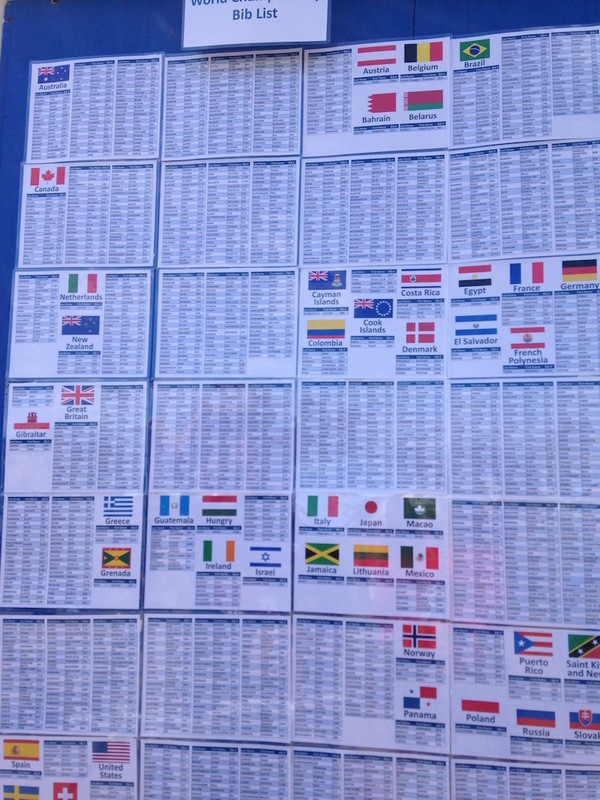 I walked up through the staging area and got photos of a number of countries that you can see here. I met up with Team USA manager Lauren Rios and enjoyed the walk to Buckingham Fountain for opening ceremonies. That’s all from here. It’s race day and I’m off to get ready! 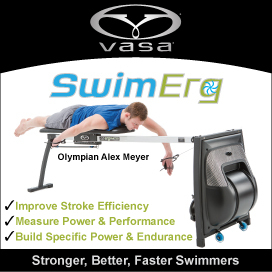 Is interest in swimming waning?